The SDLP is a party in crisis and, literally, it doesn't know which way to turn. One moment it is declaring its republican credentials, the next it is courting Ulster Unionist votes. One moment, it's throwing in the towel to promote an independent candidate, the next declaring its intention to contest every seat; one moment post-nationalist, the next the unacknowledged true heirs of Irish republicanism. Last month, the SDLP relaunched its latest policy document on Irish Unity. Clearly, the political establishment in the South hopes that the SDLP survives the next election, but Bertie Ahern's endorsement of the SDLP in 2003 did nothing to stop Sinn Féin consolidating its lead over the party. The attempt to rebrand the SDLP as a republican party has obviously been endorsed at the highest level by Fianna Fáil. 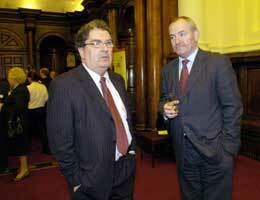 Foreign Affairs Minister Dermot Ahern attended the launch, no doubt hoping to lend the proceedings a certain gravitas. It's at moments like these that you fully realise how far Dublin really is from the North. A straightfaced Mark Durkan might have hoped to establish his party's lineage back to the militant Irish republicanism of 1916 and further still to the United Irishmen of 1798, but there was more chance of the Pope being buried as a Presbyterian. North of the border, the SDLP's initiative provided welcome relief. Now here was something republicans could really smile about. Danny Morrison, writing in Daily Ireland, led the belly laughs, dubbing the SDLP "the very secret republican party". Morrison crafted a fictional 'republican' history for the imaginary grandfathers of current members of the SDLP. Sandy Attwood, Eoghan McGrady and Durkey had us all rolling in the aisles. Of course, only the cynics amongst us believed the SDLP leader's newly-found allegiance to the Proclamation had something to do with the precarious nature of Durkan's candidacy in the forthcoming Westminster elections. The SDLP currently holds three Westminster seats, Foyle, Newry and Armagh, and South Down. John Hume established a substantial personal vote in Foyle but Durkan can be far from certain of stepping comfortably into Hume's shoes. In 2003, Durkan witnessed his party's share of the Foyle vote slump by almost 12%, with Sinn Féin's combined vote within 1,500 votes of challenging the SDLP. The fate of the Foyle seat will not only determine the fate of the SDLP's current leader, the loss of the seat at its historic heartland would inflict a fatal blow on the party as a whole. But Durkan is caught on the horns of a dilemma. Should he challenge the growing tendency of northern nationalists to choose the harder hitting, tougher republicans to negotiate their interests by sporting the Green? Or should he content himself with the SDLP's declining nationalist base and court unionist support by donning an attractive Orange? Durkan has been toying with the idea of using a tactic first utilised by SDLP MP Joe Hendron in West Belfast. Hendron courted support from the UDA in the Shankill, at the height of its sectarian murder campaign against Hendron's own constituents, in a pact to defeat Sinn Féin. Not only is Hume's former seat under severe pressure from Sinn Féin, the SDLP is extremely unlikely to hold onto former deputy leader Séamus Mallon's seat in Newry and Armagh. Most commentators see Sinn Féin's Conor Murphy as the candidate most likely to succeed at the expense of the SDLP's Dominic Bradley. Meanwhile, in Omagh the SDLP has another dilemma. Played out in the media, the 'will they or won't they' battle over endorsing an independent candidate rather than face up to the challenge of the Sinn Féin vote did nothing for Durkan's earlier tough guy stance as an 'alternative' republican. A public fallout between the SDLP leadership and the local party belied the party's longed-for image as decisive negotiators. Run the Peace Process? The SDLP increasingly seems unable to run its own election campaign. Writing in the Irish News, Brian Feeney, a former SDLP member, slammed the party's initial decision to "throw in the towel" by not standing a candidate in West Tyrone. After weeks of media speculation that the SDLP would stand aside in favour of Dr Kieran Deeny, a single-issue candidate campaigning to save Omagh hospital, the leadership announced a decision to contest the seat. Outraged SDLP members and hospital activists let it be known that the party's leadership had reneged on "a gentleman's agreement" negotiated by the local party. Campaigners had agreed not to contest council seats in exchange for the SDLP's support for Deeny as an agreed Westminster candidate. SDLP Councillor Gerry O'Doherty broke ranks to endorse his support for Deeny, recommending "all thinking people" to ignore the SDLP leadership. Durkan's decision to impose a candidate threatened to "wipe out" the SDLP in Omagh, said SDLP members in West Tyrone. At least five independent hospital candidates will now contest the council elections. "Myself and other party members are totally ashamed at the stance of our party leader and his manipulation of the party in Omagh and West Tyrone," said O'Doherty. Meanwhile, the SDLP was denying rumours of a selection row in north Belfast. Talks of a split were being played down after it emerged that attempts by the SDLP's former Belfast mayor, Martin Morgan, to stand as a local government candidate were blocked by SDLP MLA Alban Maginness. Further disunity came to light after a secret document leaked to the Irish News exposed earlier disagreements between the then leader John Hume and Eddie McGrady during the historic Adams/Hume initiative. McGrady, the only SDLP candidate standing in the forthcoming election with a realistic hope of retaining his seat, bitterly opposed Hume's role in developing a peace process with Sinn Féin. The leaked document exposes McGrady as rubbishing his party leader to a senior NIO official during a meeting at the SDLP MP's Downpatrick home in the early 1990s. McGrady is recorded as having referred to republicans more than once as the "scum of the earth". The British official briefed by McGrady was Chris McCabe of the NIO Political Affairs Division. It says a lot for the SDLP founding fathers' nationalist credentials, with McGrady effectively spying on his own leadership at the behest of the Union. Last Sunday, delivering a homily during a confirmation service in West Belfast, the presiding bishop warned the children against complacency. "If you stand for nothing, you'll fall for anything," he said. I wondered if, like me, he was thinking about the SDLP.